Amazing car smash at Roxburgh..
A BMW smashed into about five parked cars, landing on its roof in a block of flats overnight. 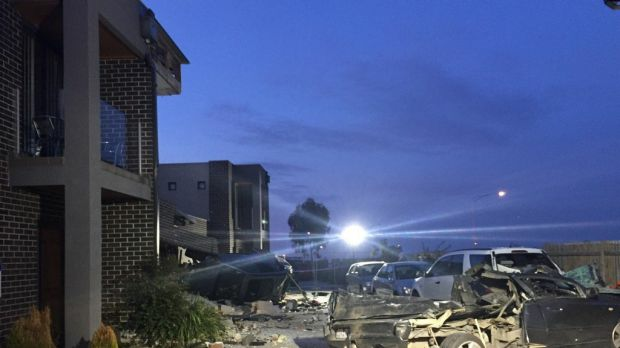 Residents in Roxburgh Park say it sounded like an earthquake or an explosion. The BWM sedan was seen overtaking a Mazda at about 11pm on Monday, before it smashed into a powerpole on Atkin Boulevard. The car then took out about five parked cars, flipped onto its roof and into about three units. Mustafa lives nearby and was one of the first on the scene. He said it sounded like a bomb had gone off and what he saw did little to change that opinion. ‘We thought we’d be definitely pulling a dead body out of the car,’ he told Neil Mitchell on 3AW Mornings.